Pea pods. Photo by Gentian Lee | Wikimedia. All types of grains; here, terms including polenta plus navy, pinto, pigeon and red beans. If you’d like to suggest additional words, use the Contact Us link on this page. See our many other food glossaries. Lentils originated in southwestern Asia along the Indus River, and have been eaten for more than 8,000 years. They are a staple food for many South Asian cultures. 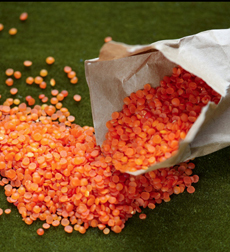 Split red lentils have a delicate, nutty taste and are commonly used in India to make spicy dals. They cook very quickly, and are easy to digest. In the West, these lentils are used in soups, stews, bakes, sauces for pasta and salads. Red lentils. Photo courtesy Malaysian Kitchen. Likely indigenous to tropical western Africa, millet is grown in many parts of the third world: It has a short growing season under dry, hot conditions. 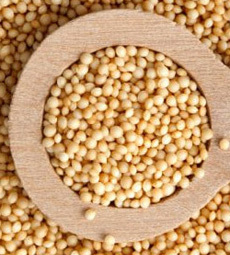 Pearl millet is a staple food crop in Africa, india and Southeast Asia. Varies varieties of millet have been cultivated in East Asia for at least 10,000 years. Here’s more about millet, plus recipes. Millet. Photo courtesy Bob’s Red Mill. These are whole yellow lentils (moong) that are split and hulled. Native to India, they are tiny cylindrical seeds, easy to cook and to digest (in Ayurveda, split moong dal is recommended for children, elderly people and convalescents as it is easily digested). The whole moong beans and split ones are quite different and seldom interchangeable. Their preparation is similar to masoor dal, the split red lentils. 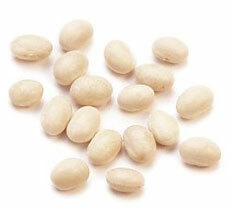 The navy bean (Phaseolus vulgaris) is a pea-sized, off-white, oval bean, about 3/8-inch long. It is so-named because it has been a staple food for the U.S. Navy since the mid-1800s in soups, pork and beans and other bean dishes (it absorbs flavor easily, so it works well in soups). It is related to the kidney bean and is the most widely known bean in the white bean family. Navy beans have a mild flavor and mealy texture. Navy beans available at Amazon.com. 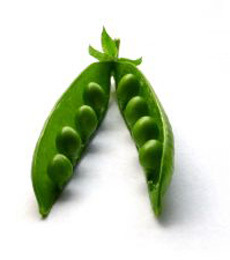 Peas (photo at top of page) are a member of the legume family, the seed or seed-pod of the legume Pisum sativum. 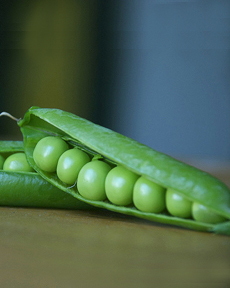 Each pod contains several peas. It is botanically a fruit because the seeds are contained inside the pod, although like other savory fruits (cucumbers, tomatoes, zucchini) it is treated like a vegetable in food preparation. There are many varieties of peas, including cowpeas, pigeon peas, snow peas and snap peas, which are available fresh, frozen or canned; peas are also grown to produce dry peas like the split pea. Fresh peas. Photo by Marta Rostek | SXC. The Pigeon pea (Cajanus indicus) is a bean native to Africa that is now widely used in Caribbean and Southern American cooking. These small beans grow in a long, twisted, fuzzy pod. They are about 1/4 inch round and have a beige color with light brown speckles; color fades with cooking. The flavor is pungent, the texture is mealy texture. 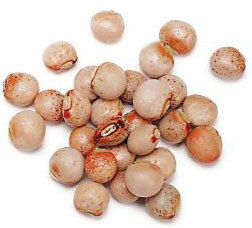 They are also known as caja pea, Congo pea, gandule, goongoo pea and toor dal. Pigeon peas are available at Amazon.com. An oval, beige-colored bean distinguished by its tan splotched surface. It is popular in Mexican dishes including chili, refried beans, rice and beans, soups and stews. 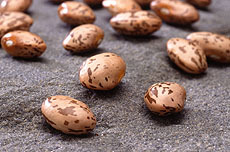 Photo of pinto beans by Scott Bauer, U.S. Agricultural Research Service. 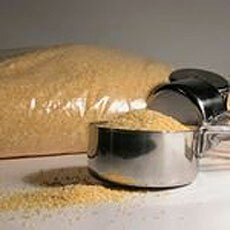 Polenta is simply coarsely-ground corn, also known as cornmeal, that is cooked with stock or water. It is known in America as cornmeal mush. See also grits.